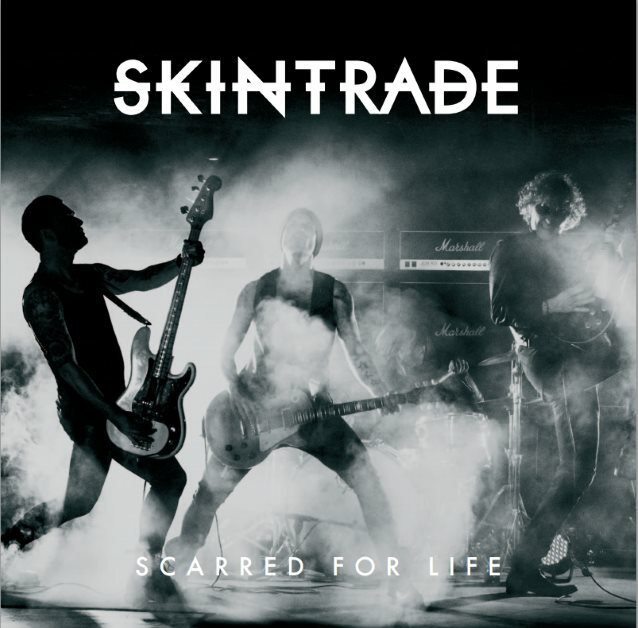 Swedish hard rockers SKINTRADE will release their new album, "Scarred For Life", on July 24 via AOR Heaven. 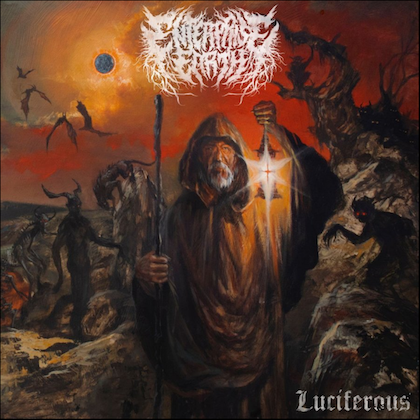 Once again, the CD was recorded, co-produced and mixed by Oscar Ammer. This time SKINTRADE also worked with producer Geo Slam on the song "Wide Awake", originally recorded by Katy Perry. "We wanted to do something special on this record and I came across this song and instantly liked it. 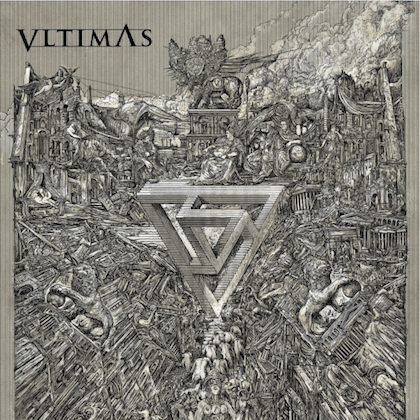 It had that quality we were looking for in a cover and we felt we could deliver a version true to what SKINTRADE stands for and still pay our respect to one of Sweden's most outstanding songwriters and producers, Max Martin," says SKINTRADE vocalist Matti Alfonzetti. The band is currently shooting a video for "Wide Awake", to be relased late this summer. Working with producer Geo Slam was also a highlight. "Geo had a different approach to what we usually go for and the result was awesome," Matti said. According to SKINTRADE, "Scarred For Life" saw the band concentrate on "songs and musicianship" and it is "a natural follow-up" to 2014's "Refueled". 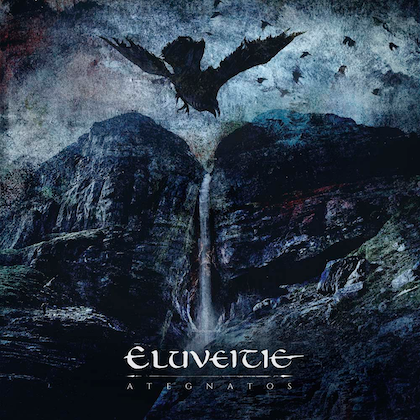 "Our focus always was and always will be on the songwriting and the ferocious riffs and grooves to match," says Alfonzetti: "This time we started writing almost within a week after the release of 'Refueled'; that's how inspired we were to continue releasing good songs and to show our fans that we are in it. "We're really proud of the new album and we definitely feel that this is our best effort so far. We can't wait to get out on the road again and meet our old friends and to make new ones." SKINTRADE is currently on tour in Europe to promote "Scarred For Life" and plans to stay on the road extensively throughout 2015. 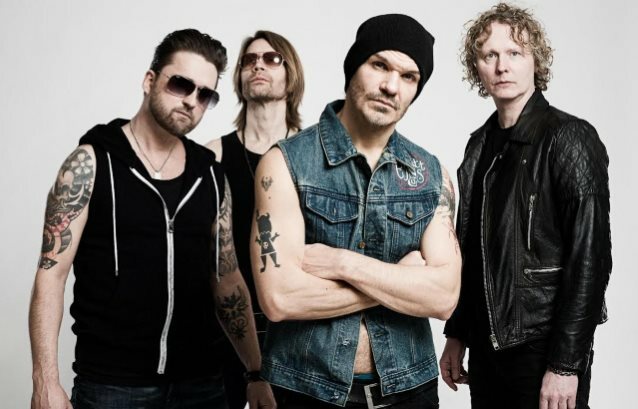 SKINTRADE was formed in 1992 by Matti Alfonzetti (vocals), George Bravo (guitar, backing vocals), Stefan Bergström (guitar, backing vocals), Hakan Calmroth (bass) and Håkan Persson (drums, backing vocals). The group's self-titled debut was released in 1993 and received overwhelmingly positive respnse from both media and audience. The singles "Sick As A Dog" and "One By One" were played frequently on the radio and their videos spun on MTV's "Headbangers Ball". The same year, SKINTRADE was honored with a Zeppelin award for "Best Hard Rock Album" and was nominated for a Swedish Grammis (Grammy equivalent) in the category of "Best Video." The follow-up CD, "Roach Powder", came out in 1995 with Thomas Skogsberg as a producer (ENTOMBED, DISMEMBER). The videos for the singles "Snap Goes Your Mind" and "Flies" were played regularly on MTV. Between 1993 and 1995, SKINTRADE embarked on several tours of Europe and played at some of Sweden's and Europe's biggest festivals such as Sweden Rock, Hultsfred, Dala Rock, Dynamo Open Air (Holland) and Rock Am Ring (Germany). SKINTRADE also supported the Danish band D-A-D on their European tour in 1995. One of their last and most memorable gigs took place in late 1995 with the Irish band THERAPY? during a live radio show in Amsterdam, Netherlands. SKINTRADE disbanded shortly thereafter. The idea for the SKINTRADE members to collaborate again came about as they got more and more requests from fans asking them to make new music. During the first rehearsal in May 2011, it became obvious that the band's chemistry was very much intact. In the summer and autumn of 2011, SKINTRADE recorded four new songs at Sound Trade Studios with their old friend and partner Ronny Lahti, engineer and producer who previously worked with the band on all the recordings in the '90s. SKINTRADE's "best-of" album, "Past And Present", was released in March 2012 via Universal Music. The CD includes three new songs and 12 classics.